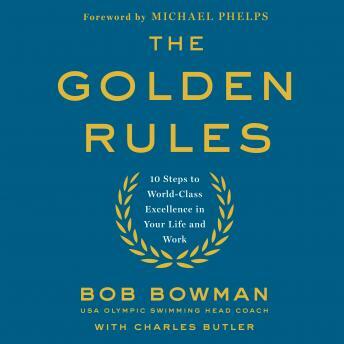 Bob Bowman, best known as the coach for the record-breaking run of Michael Phelps, is one of the most successful coaches in Olympic history. He is lauded for his intense personality, incredible dedication to his athletes, and his ability to nurture talent in athletes who have the heart and drive to win. This is his motivational book about winning in all walks of life and what you have to do to get there. He presents ten key concepts that all people should live by. Illuminating his lessons with spirited anecdotes, Bowman will teach you how to get gold out of every day by setting goals and getting motivated to achieve them. He will explain that taking risks is the key to success in any pursuit, and coach you on how you can make yourself risk-averse. By following The Golden Rules, you will learn to visualize in order to achieve your goals, and that above all else, dedication to your training, your job, or whatever area it is you are seeking to triumph in is paramount for success.